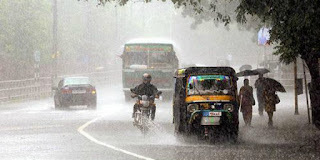 Thiruvananthapuram: Heavy rain along with strong wind and lightning affected normal life in the state capital Monday. The 12 hour non-stop rain flooded low lying areas and important roads and also claimed one life. Georgekutty John, a 74 year old man died from electric shock from a fallen electric line at Nalanchira. Thampanoor, Thycaud, Puthenpalam, Thekkumoodu, Manacaud, Vanchiyoor, Kannammoola, NCC Nagar, Ambalamukku were most affected. Schools and colleges were given holiday following the unexpected and heavy downpour.